This summer I’ve been pretty absent from my studio. The reason behind this hasn’t been the nice weather, or anything so simple. The reason is that I’ve decided to push myself beyond what I’m comfortable with, beyond clay. I’ve spent the last month turning my basement and backyard into a mad scientist’s lab while trying all sorts of new materials. I figured it would be a good idea to sum up my experiments so far. 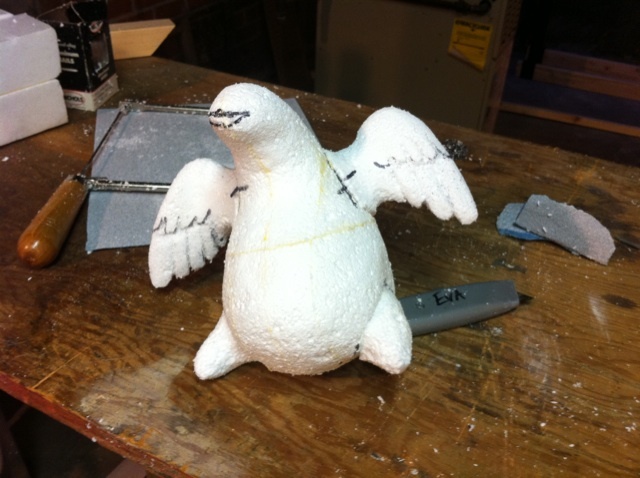 I started with a vague idea that I should carve stuff out of Styrofoam. Here’s where things have developed from there. Styrofoam is a specific brand of expanded polystyrene (EPS) foam, that white crumbly stuff. It carves extremely nicely, and apparently most theme park decorations or large advertising objects are EPS coated with urethane and fiberglass. Anyway, the professional way to do it is to use hot wire tools. I tried that, but found it far too fumey for anywhere inside. However, regular saws and rasps go through it like a breeze, if you don’t mind vacuuming ever 20 minutes. Straight Pins or flower arranging pins are also very useful, for holding on parts before you’ve glued them. There’s a number of different ways of getting large blocks, but I stuck with scrap pieces while experimenting. I cut apart some old packing materials, gluing them into solid blocks. I ended up seeing several recommendations for glues to use on Styrofoam, so I just decided to test everything I could find. Here’s my conclusions. Wood glue/ Elmer’s: Seems to work ok, but the middle sections of your block will never dry. It’s usable, but not ideal. Gorilla glue: This will dry well, but it’s so much harder than the Styrofoam that it will make carving difficult. 3M 77 spray adhesive: This specifically says not to use it on Styrofoam/ expanded polystyrene. This is because it has acetone in it, which could dissolve the foam. However, if you use as directed (Spray from 12″ away, and wait at least 30seconds before attaching the pieces), the acetone *appears* to evaporate away with out damaging the foam. A test piece created with this hasn’t shown any ill effects after a few weeks, but I wouldn’t use it on anything you want to be archival. That said, it attaches perfectly well, has some flexibility, and the seam carves just like the rest of the foam. 3M Styrofoam spray adhesive: I never had a chance to find this, but I suspect it’s similar to 3M77 but without the acetone. If I was going to be focusing more on Styrofoam in the future, I’d take them time to track it down. Styrofoam has its downsides, including the fact that it dissolves when exposed to anything with a solvent, such as epoxy or fiberglass. It also won’t be that durable until you can apply some type of coating to it. So, like with the glue, I went about testing different stuff. Foamcoat: I feel pretty certain that this is something I’ve worked with before, just re-purposed. Heavy duty spackle? Some sort of instant plaster? Regardless, it’s extremely heavy, goes on goopy, and is a bit brittle after it sets. To get a durable coat on, you’d have to apply a lot, maybe 3/8″ coating over everything. I’m not that impressed. At least it’s sand-able. Might be useful when making theater backdrops or something. Styropoxy 7045: There’s several different varieties of styropoxy. All are designed to go on Styrofoam/EPS, extending its life and making it safe from epoxy and solvents. I bought the 7045, which goes on extra thick and is designed to be sanded afterwords. They also have a Syropoxy 7015 and a 7060, which are thinner and are painted on. The numbers refer to working time. The 7045 handles a bit like a cross between those and bondo (Auto body filler). If I were buy more, I’d go with the 7015 or 7060. Better to get the thinner version, and then supplement it with bondo where needed. Bondo (after the Styrofoam has been sealed): It’s my first time using Bondo and it appear to be very useful, if very nasty, stuff. It’s made for autobody repair. You apply it, then should sand it right away before it hardens all the way. You can sand it afterwords as well – though a power sander will help. It hardens rock hard and very durable. 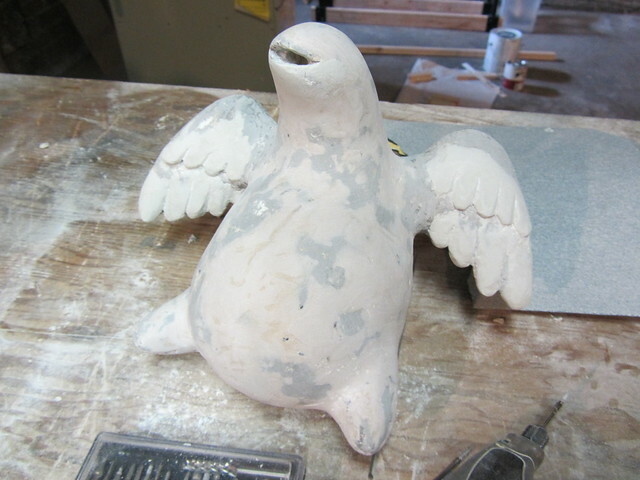 Apoxie Sculpt (After the Styrofoam has been sealed): This stuff is like the love child of epoxy and sculpy. It’s a two part clay that will harden rock hard within 24 hours. I’m undecided as to where I stand on it. It’s useful, but I’m not fond of it. I hate sculpting in rubber gloves. It’s close enough to clay I want it to act exactly like clay, and I’m disappointed when it doesn’t. I had more luck carving fine details in after the fact with a dremel, though like everything I’ve been talking about, don’t sand or carve it without a respirator mask. Acrylic Hard Molding Paste: I’d heard a suggestion online that acrylic molding paste might be a useful top coat, since it’s hard, sandable, and is basically marble dust secured in a polymer. I wasn’t that impressed with it. It clearly would take several coats, and it seem like it’s too flexible to add much in terms of structural integrity to the piece. It would be useful to add texture to go under paint, which is its intended purpose, but not as permanent hard coat for a foam creature. You might be able to put this straight on Styrofoam, but I didn’t try it. 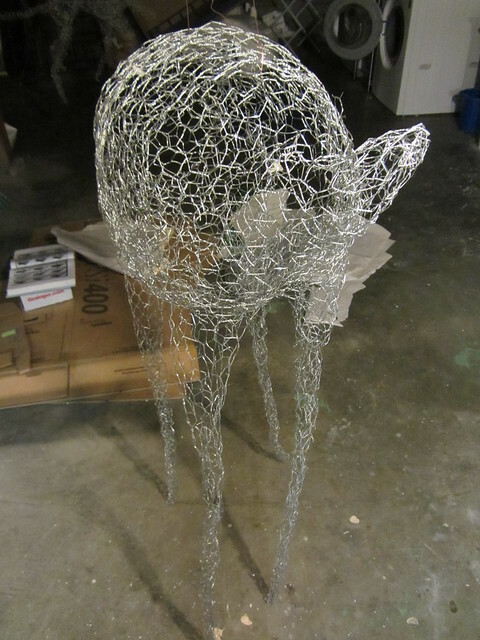 Chicken Wire: Chicken wire is actually the reason I don’t see myself doing any more Styrofoam sculptures. 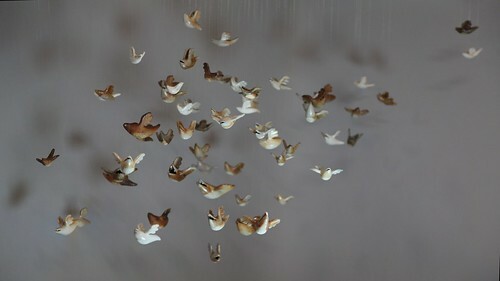 I started experimenting with chicken wire to see if it could be used for an armature, only to discover the wire armatures had so much more life and movement than my trial foam pieces. Evidently, I need to sculpt in a material I can bend. I immediately started researching what I could do starting with a base of chicken wire. Spray Insulation in a Can (Great Stuff/ Hilti): My first experiment was coating the chicken wire in spray foam. I first tried spraying it on the outside of a chicken wire. The foam was a bit hard to control and led to a messy coat about an inch or two thick. I then tried loosely covering the outside of the chicken wire in plastic, and spraying the foam along the inside. While that looked promising at first, the foam fascinatingly shrank back as it cured, sucking the plastic in with it. I ended up giving up on both methods regardless, because the end foam is too squishy, and I’ve heard some people online claiming it can shrink over time. In short, not archival quality. AB polyurethane foam: AB foam is pretty cool stuff, and actually the present focus of my experiments. You mix to parts together for 30second, and then it rapidly expands between 10 and 18 times its original volume, setting carvably hard within five minutes. 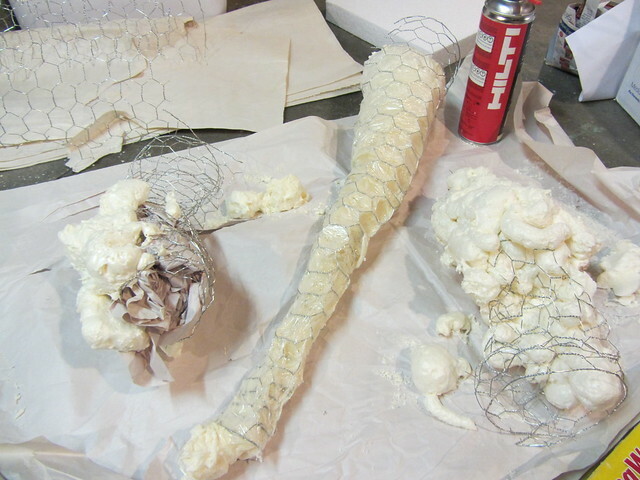 I’ve been experiment with coating chicken wire forms in plastic, and then pouring the foam into the form. It expands, pushing out the plastic, creating a carveable coating around the chicken wire form. I’m still experimenting with various plastics, but I think this is a promising line of experimentation. 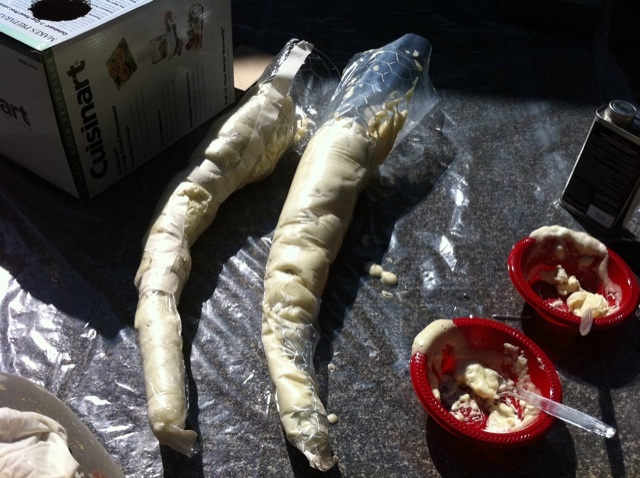 You can apply bondo or fiberglass directly to polyurethane foam, unlike Styrofoam/polystyrene.. 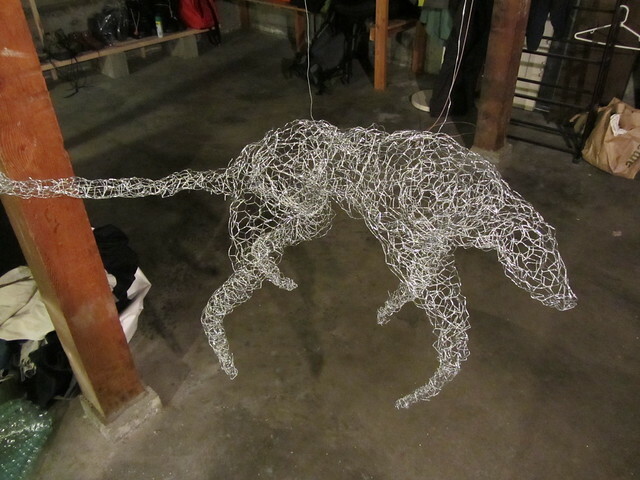 I have an chicken wire armature ready to turn into my first full size foam beastie, one about 4 foot tall. 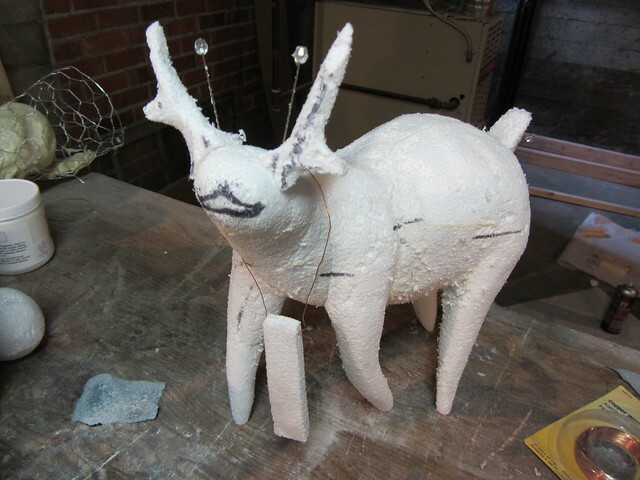 I’m planing on building a structural system of metal rods and PVC pipe inside the armature. I’ll coat it with AB foam using my plastic wrapping method. After that, I’ll sand it smooth and coat it all with a thin coating of bondo to give it more structural integrity. I think I might finish it with autobody paints. I feel pretty good about this plan, though I do have more finishing methods still lined up to test. There’s a chance this all might have to wait a bit, since I’ve heard talk of another woodfiring, but I can’t wait to turn this research into a finished piece! 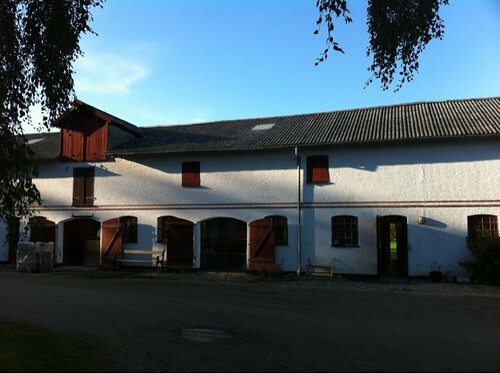 I’ve been at Guldagergaard for a week now. Strange to think I’m already 1/5 of the way done with my time here. It’s been a pretty cool experience so far, and is clearly a great community. GG is set up so that various artist come in from all different countries, staying in an old manor house, and working together in the studios, which at one time were the horse stables. 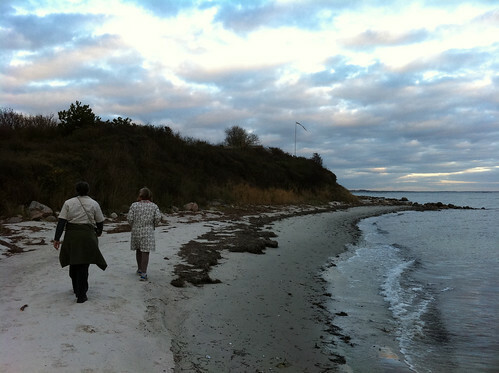 We presently have 7 artists and assistants from Finland, Denmark, Canada, and the US, with a number of other folks wondering in for a day or two. 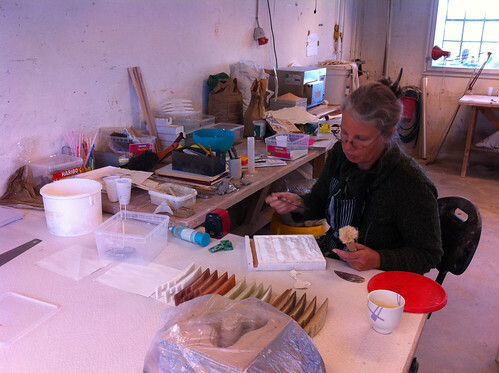 The assistants spend part of the day firing kilns and what not, but work on their own projects too. We’re all working on our own work, but since we’re in a communal space, it’s a great set up for exchanging ideas and theory. The work of the other artists range from functional ware, to figurative sculpture, to wonderfully abstract glass pieces. The glass artist is here in order to figure out how to incorporate ceramic material into her pieces. While everyone put forward proposals about what they’d be working on while they’re here, the set up is so inspiring and filled with new ideas that they may end up working in the entirely opposite direction. 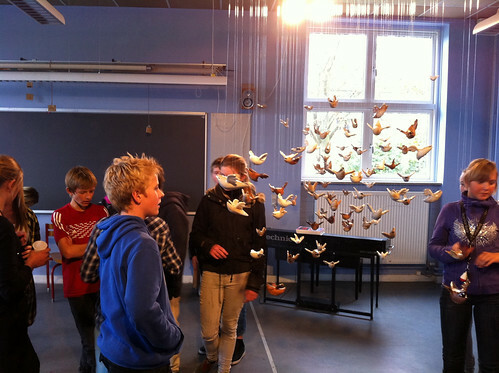 My proposal was to build a giant swarm of flying creatures as an installation. While I have quite a few additional ideas I think I’m going to explore, I’m going to keep going on the flying beasts as well at the same time. Guldagergaard itself is very cool, as well. In addition to wonderful assortment of kilns and supplies, it also has extensive library of ceramic related reading material. And that’s not even mentioning its actually collection of ceramics, both in its gallery and in the house! I’ve been making sure to use a different mug every day, but I still need to go spend some time staring at the amazing work in the gallery. It’s tough to avoid feeling intimidated by the sheer amount of incredible work around. It’s also located in the middle of a public sculpture park, with random members of the public wondering by on their bikes, and occasionally sticking their heads into the studio. 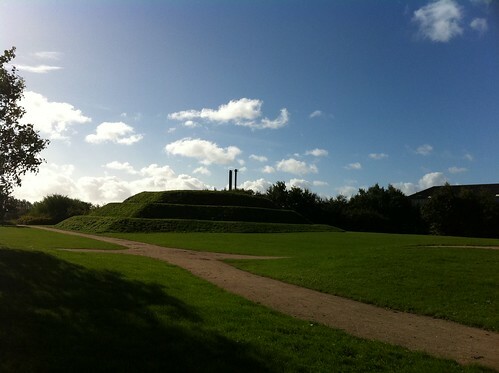 My favorite part of the sculpture park is a giant earthwork spiral mound. By walking around it, you eventually reach the flattened top with a view of windmills, housing developments, and fields. When I walked to the top today, I walked right by a hare, hunkered flat, trying incredibly hard to convince me of its own invisibility. My average day seems to be chunks of two to three hours in the studio, interspersed with exploring, eating, and talking with the other artists. I have access to a bike, and often take off in a random direction with a thermos of tea and my sketch book. The movement and the sight seeing helps me think. I’m generally in the studio until after 11 at night, which is actually a fun change for me – reminds me of my college days. So that about sums up my observations on the place so far. It’s just a really great place to be and to be making art. I’ve uploaded some of the pictures I’ve taken so far to flickr! I had some very odd news this week. 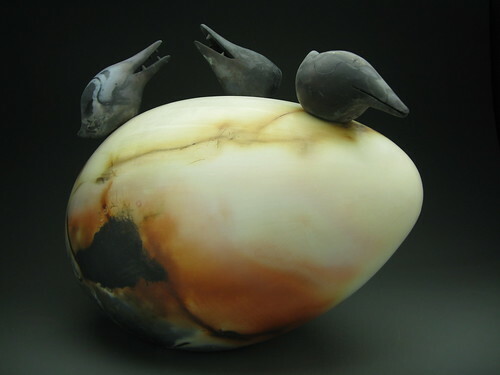 One of my pieces, Cuckoos #3: Unexpected Twist, just finished being displayed in the 3rd Biennial Concordia Continental Ceramics Competition in St. Paul, MN. I’d been stressing about the piece being shipped back, since it’s both large and delicate. When I got a call on Monday from the organizer, I immediately started worrying, only to be utterly surprised. The piece had been stolen. While the gallery was open for local artists to pick up their work, someone had walked in and left with four piece that did not belong to them. The university didn’t realize the problem until they were preparing to pack up the out-of-town pieces. A vase by Leopold Foulem, a wonderful teapot-ish sculpture by Gerald Ferrari, and a piece by Kevin Snipes were also taken. (Gerald has a very insightful blog post about the theft.) The total listed value for the work was over $12,000, most of that was due to Foulem’s vase. 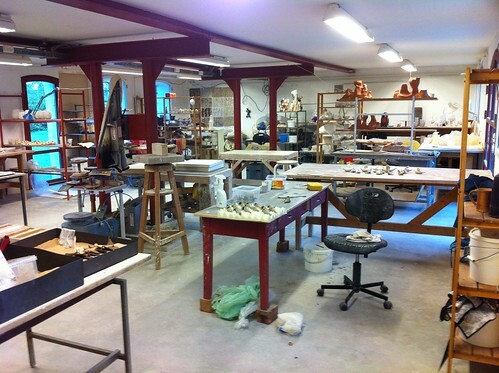 All the same, a life of crime stealing ceramics sculptures is hardly a way to get rich quick. Heck, if there’s a way to get rich in ceramics, there’s lots of ceramics artists who’d love to know about it. Overall, my response has mostly been confusion. I am a bit worried about my piece, as to whether or not its safe. My biggest fear if that some scofflaws just grabbed it on a whim, and it’s been trashed somewhere. That would break my heart. The university has said that they’ll deal with the insurance, so at least I’m not worrying about that. They could have handled the show taken down better, but no sense in being angry about that – they didn’t want this to happen either. I guess it’s a bit flattering that someone likes the piece so much, but really, it would have been better to for them to just buy it. It’s been so weird seeing pictures of it on the local news, and having my relatives emailing each other about it. Add to all that, it’s not a small piece! It’s large enough it needs to be carried in both arms, and the surface is delicate enough that it could be scratched by snaps or zippers. While I guess do feel strangely honored to be on a list that includes everyone from Miro and Van Gogh to the other 3 artists from this show, I would really rather people just didn’t do stuff like this. It’s so disrespectful to the artists, the work, and the institution that it’s hard for me to wrap my mind around it. Not cool, random thief, not cool.